Happy birthday Karen Hesse (Out of the Dust). It’s the birth date of Joseph Jacobs (1854-1916), English Fairy Tales. In 1758 the first American Indian Reservation is established at Indian Mills, New Jersey. Read The Absolutely True Diary of a Part-Time Indian by Sherman Alexie. Shays’ Rebellion begins on this day in 1786. Read The Bar Code Rebellion by Suzanne Weyn. It’s More Herbs, Less Salt Day, which works nicely with our vegetable theme. Read Herb the Vegetarian Dragon by Jules Bass, illustrated by Debbie Harter. Toward the end of August, those of us with vegetable gardens find ourselves with an abundance of crops—and those who don’t grow their own vegetables can delight in all of the produce available at local Farmers’ Markets. August has been designated Celery, Fennel and Cactus Month along with Mushroom and Onion Month. But for me as a New Englander, August might as well be Zucchini Month. I find books for the Almanac in a variety of ways. But certainly one of the most pleasant ways comes from recommendations of other book lovers. In May I was sitting in Isabel Baker’s booth at a conference in Philadelphia and asked this maven of the preschool set if she had located anything she really loved this year. As the proprietor of Book Vine, Isabel knows more about books for the very young than anyone in the country. She reads, thinks, and dreams about exciting our youngest children with books. Into my hands, without further ado, Isabel placed a copy of April Pulley Sayre’s Rah, Rah, Radishes! The book actually has been dedicated to Isabel, but that was not the reason for her enthusiasm. In this new book, April Pulley Sayre has written a love letter to vegetables—all kinds of vegetables. She includes celery, mushrooms, onions, squash, kohlrabi, cucumbers, and eggplant. The text has been constructed as a cheer for vegetables: “Cucumber’s cool. Kohlrabi’s queen!” Not only does reading it aloud make one long for vegetables, but the brilliant and crisp color photographs taken at the South Bend, Indiana, Farmers’ Market show just as much enthusiasm. By the time readers come to the final statement, “Veggies rock!” they have become true believers themselves. 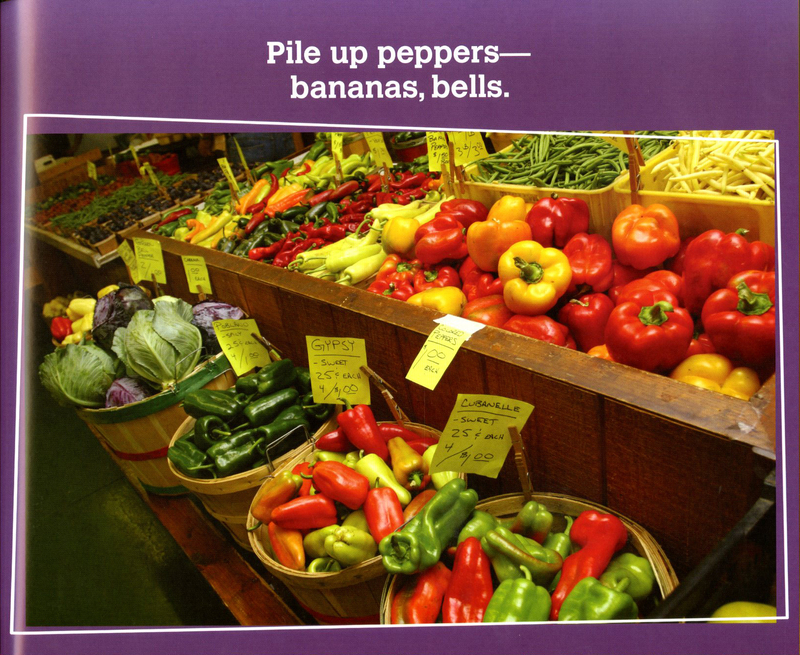 Sayre also includes an informative afterword about vegetables and a list of some that didn’t make it into the book. The book naturally lends itself to writing exercises—how would a child cheer on some of his or her favorite vegetables? So toast those tomatoes; fill up your baskets with fennel; and use today to celebrate vegetables. Rah, Rah, Radishes! Yes! Originally posted August 29, 2011. Updated for . 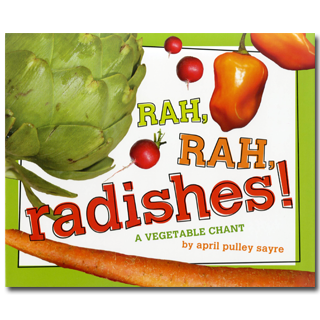 Instructional materials from TeachingBooks.net for Rah, Rah, Radishes! We just checked this book out from the library last week! Loved the rhyme and the celebratory mood of it! My vegetable-loving two year old loved it!! April is in tune with nature and all things vegetable, animal and mineral. I doff my cabbage leaf hat and curtsy to her outstanding achievements! To my astonishment, I learned that fresh vegetables can be an amazing experience. I learned that from the people who owned a small French restaurant in our area. It was my first experience with French cooking. Unhappily, they moved to a different state, and I loved their food so much, I kept threatening to drive to the new location which was two-hundred miles away. I’ll be reading this one soon. I still love this website. “Go, Go, Grapes” just came out in May 2012. A wonderful book by this same author about fruits. Both books make you want to try and eat healthy fruits and vegetables.